First, the Ram ProMaster includes a six speed automatic transmission. This ensures that your cargo van will be able to smoothly accelerate in all weather conditions. This is also the case whether you're hauling a full load or driving back empty after a delivery has been made. 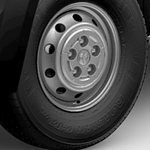 Finally, the ProMaster includes a best in class 36 foot turning radius. This allows this cargo van to get into much tighter spots where a typical large truck may not be able to travel.